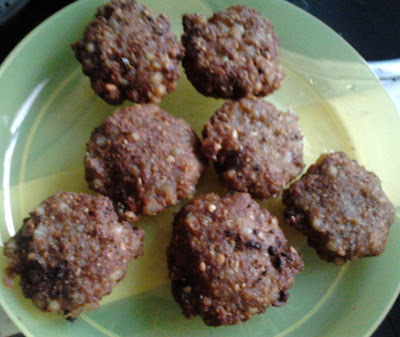 This is a very famous and traditional dish of Maharashtra. People usually make this during fasting as it doesn't involve garlic or onions. Very delicious snack. The crunchy peanuts makes it more tasty. It is well known for it's texture and is crunchy outside and puffy inside. It is gluten free recipe. Everybody can enjoy the awesome taste of this recipe. My favorite snack. Optional - Can use baking soda and rice flour. The sago should be soaked well for it is fried. If the dough is very sticky and if it sticks to your hands then either dust your hands with rice flour or apply little oil on both your palms. Refrigerating the dough will help to avoid retention of oil. Frying oil is supposed to be hot else vadas will turn out greasy and may break into pieces while cooking. Sabudana Vada tasted best when they are served hot. Take a bowl and mix all the above mentioned ingredients to form a dough, which will be a little sticky and soft in consistency. Now take a small portion of a dough and make it into a round flat shape like that of a patties. Repeat for all of them. Slowly drop the patties into the frying pan.